There’s a lot more to buying a home than browsing properties and choosing the one you like best. Our step-by-step guide to the home ownership process will make sure you’re fully prepared and have the entire process under control, every step of the way. Have an initial meeting with your REALTOR® and be sure he or she is the one you want to do business with. Meet with a mortgage broker before you look at any houses. This will save time and frustration in looking for a home when the parameters are defined. Once you have a pre-approval from your mortgage broker, have them send an email to you and your REALTOR®. All three of you can then work as a team to find your perfect home (communication is the key). Now that you have your pre-approval, tell your REALTOR® a list of needs and wants in your new home. Remember, the more accurate you are, the easier it will be for everyone. Have your REALTOR® do a professional search for you. You may be a seasoned veteran at online house hunting, but your REALTOR® does this for a living, so they might have a few tricks to speed up the process and narrow the search. Also, remember the public MLS runs off the REALTOR’s® MLS and the information will always be more up to date with the professionals. Visit homes with your REALTOR®. Make sure to give lots of feedback, both positive and negative. Your REALTOR® will be listening so he or she can narrow or broaden your search criteria. Once you have found a home you like, your REALTOR® will perform a Comparative Market Analysis (CMA), for the house you want to make an offer on, so you can make an informed decision on what you want to offer. Once you have decided on the price to offer, your REALTOR® will fill out the real estate purchase contract and explain it as you go in easily understood terms. Your REALTOR® will make sure that proper conditions are added to the contract so that you have all the tools to perform the thorough reviews and inspections necessary. Your REALTOR® will submit the offer in writing to the listing realtor, and the negotiations will begin. Once you have agreed on a price that is acceptable to both sides, the corrections will be made to the original contract, and both sides will initial the changes. Once both sides have initialed the changes and have a copy of the contract, you will need to provide an initial deposit to the listing side to hold in the trust account. At this point your REALTOR® will email a copy of the purchase contract to your mortgage broker so they can begin the final approval stage with your mortgage by getting all the documents to the lender as quickly as possible. This is another reason why it is very important to have your pre-approval done: so that you have the documents ready and will not be rushed. While the mortgage broker is working on your financing, you should book a time with a home inspector right away. Booking a home inspector sooner rather than later will give you extra time to deal with any problems that might come up. Note: A home inspector is a 3rd party and works directly for you. Your REALTOR® might have suggestions, or have preferred companies to refer, but it is your right and responsibility to pick a qualified home inspector. The listing REALTOR® will have the condo documents ready for you to pick up. You will need to make arrangements to get them dropped off with a qualified condo document reviewer. These professionals have experience in reviewing the financial standing of the condo corporation and will be able to explain the state of your condo to you in a way you can easily understand. Just like a home inspection, you should review the condo documents as soon as possible so you can have any questions answered that might come up before the day you have to remove the conditions. Note: A condo document review company is a 3rd party and works directly for you. Your REALTOR® might have suggestions, or have preferred companies to refer, but it is your right and responsibility to pick a qualified home inspector. At this point, all of the professionals should be working for you to get your conditions satisfied. This is a good time to find a real estate lawyer to handle the closing of your sale. Note: A Real Estate Lawyer is a 3rd party and works directly for you. Your REALTOR® might have suggestions, or have preferred companies to refer, but it is your right and responsibility to pick a qualified Real Estate Lawyer. Once your mortgage broker has a firm commitment from a lender to give you a mortgage, they will ask you to sign a commitment letter from the lender. After this, the mortgage is yours. As soon as you are satisfied that you have secured the mortgage, you will need to sign a “notice of waiver/satisfaction of conditions.” This one page form basically states that you have secured a mortgage, or that you are reasonably sure that your mortgage has been secured and you want to “waive the financing condition,” making this part of the contracting firm. Once your home inspector has completed the home inspection and has taken the time to properly explain his report, you will know if you want to proceed with the purchase or walk away. If you are satisfied with the condition of the house you will need to sign a “notice of waiver/satisfaction of conditions.” This one page form basically states that you have completed a home inspection with a licensed home inspector, that you are satisfied with the condition of the home, and that you want to “waive the Home Inspection condition,” making this part of the contracting firm. The condo document reviewer that you choose will take a few days to review your document. They will then schedule a meeting in person or over the phone to review the state of your condominium. If you are satisfied with the condition of your condominium after that review, you will need to sign a “notice of waiver/satisfaction of conditions.” This one page form basically states that you have reviewed the condo documents, that you are satisfied with the current state of the condominium documents, and that you want to “waive the financing condition,” making this part of the contracting firm. At this point, you have removed all the conditions, and you have a firm deal. Take a deep breath knowing that the uphill part is done. Your REALTOR’s® conveyancing department will be taking the offer, the signed waivers, and any other amendments that were made to the contract, putting them together in a file, and sending them to the lawyer that you have chosen. Your lawyer will have your contact information sent to them when your REALTOR’s® conveyancing department sends over the file, but it would be a good idea to phone your lawyer and make sure they know who you are and how best to contact you. It is a good idea to phone your utility companies and advise them on your upcoming move. You will have enough things to do on a moving day without worrying about setting up your gas or electricity. Take a look at our Address Change page to find out whom you should contact. Call your insurance company to put fire insurance in your new home; you will not be able to take possession without fire insurance in place. Approximately ten days before the possession date, your lawyer will want to meet with you to sign the final documents for the sale of your new home. Remember to bring your ID. Now that you are in the house you will do a walk through with your REALTOR® to make sure everything is in accordance with the contract. If there are problems, your REALTOR® will inform your lawyer, and they will seek a solution. Finally, the day is here! The process starts the morning of, when your lender sends the mortgage proceeded to your lawyer’s trust account. Your lawyer then sends the mortgage money along with your down payment to the seller’s lawyer’s trust account. Once the selling lawyer has confirmed that the full amount has been received in their trust account, they will phone the listing agent and tell them to release the keys. The listing agent will then tell your real estate agent that the keys have been released and he can pick them up, and release them at 12:00 noon. Note: please keep in mind that it is common to have a wire transfer be held up for a variety of reasons, so don’t book movers, cleaners, or other professional services for 12:00 noon, as you might not get access to the property at that exact time. Ask your REALTOR® when to book these services. Enjoy your new home and call your REALTOR® if questions come up along the way. Even though the transaction is complete, your REALTOR® should still have the mindset of working for you. If you have been happy with the service your REALTOR® has provided… refer them! Friends, family, and coworkers deserve to be as happy with the buying or selling of their new home as you are, so share your experience with them. The highest form of thanks to your REALTOR® is when they receive a referral because of your kind words. 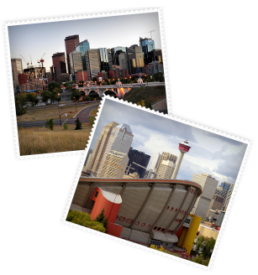 The Calgary Real Estate Advantage team can assist you with every step of the home ownership process. Call 403-968-1496 or message us online to get started today!